It's a relic from the past. Many old games have battery backup capabilities, and if that battery is still doing its job, it reveals pieces of the past from the previous owner. 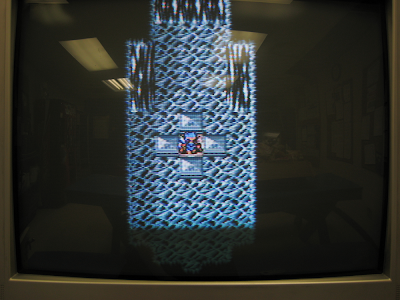 Today, let's take a look at some saves on a Final Fantasy 2 cart I bought. 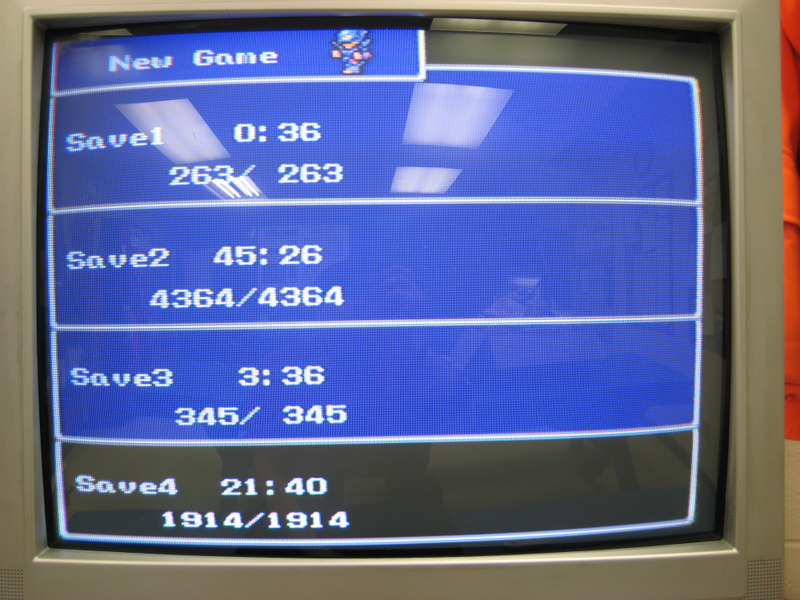 A while back, I picked up an extra copy of Final Fantasy 2 at a pawn shop. I still have my original copy, but the price was right ($4.99) and I figured it wouldn't hurt to have a second one. I just got around to trying it out, and what I found inside of it inspired me to write up this quick article. In fact, it kind of made me sad as well. After turning the game on, I saw that every one of the save slots was occupied. Good sign, because that means the battery backup still works! Unfortunately I had to delete one of them to make room for my play session, so I saved over the first one which was barely into the game at all. The first save slot shown is actually my save. I didn't take any pictures of it before I saved over it. Doing so, however, made me a little sad. Someone had started to play the game, perhaps one last time before selling it off. I imagined that they started up the game and remembered how much fun they had with it all those years ago. It could have been one of the people whose names I saw in the other save files. Maybe they had to sell their game because they really needed the money. Maybe their mother sold it when they went off to college. Maybe the owner just no longer cared. In any case, I had to write over their experiences so I could create my own, and that bummed me out a little. Here are the characters from the second save slot. This one had the most time devoted to it at just under 45 and a half hours. For 45 and a half hours someone played this game! That's the kind of time you devote to a game you truly love. 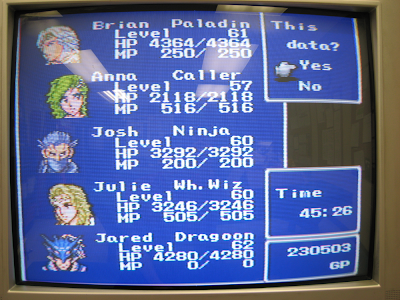 Since Cecil is the main character, I assume that Brian is the name of the person who was playing this save file. Perhaps Julie was a girl he went to school with that he secretly had a crush on, too. The other names... maybe his friends Josh and Jared. Anna could be his sister. Or, maybe Anna is another girl he had a crush on. Hey, I did that back in 1991, too. Don't judge. In any event, it's so mysterious! I will never know the answers. The save slot is the final one in the game right before the Lunar Core. They had all the best weapons and armor in the game (except the Adamant Armor) and their levels were high enough that they had more than likely beaten the game. 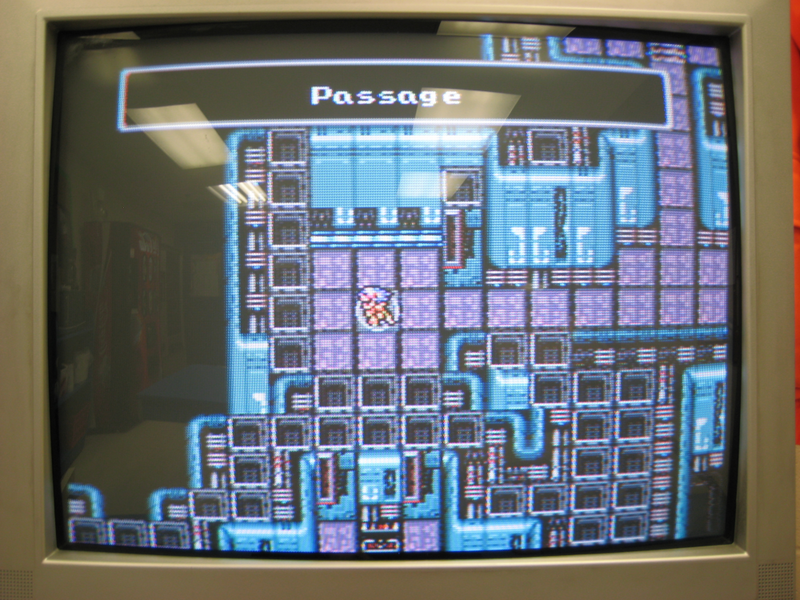 This is the save slot of someone that loved Final Fantasy 2. They didn't max out their characters, but they saw the game through until the end. I will never save over this file with my own. 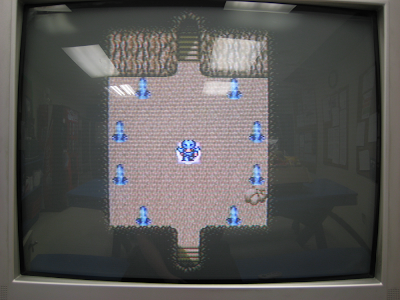 The third save slot is near the beginning of the game. They had only put three and a half hours into it before calling it quits. I imagine that they got stuck and didn't know where to go. 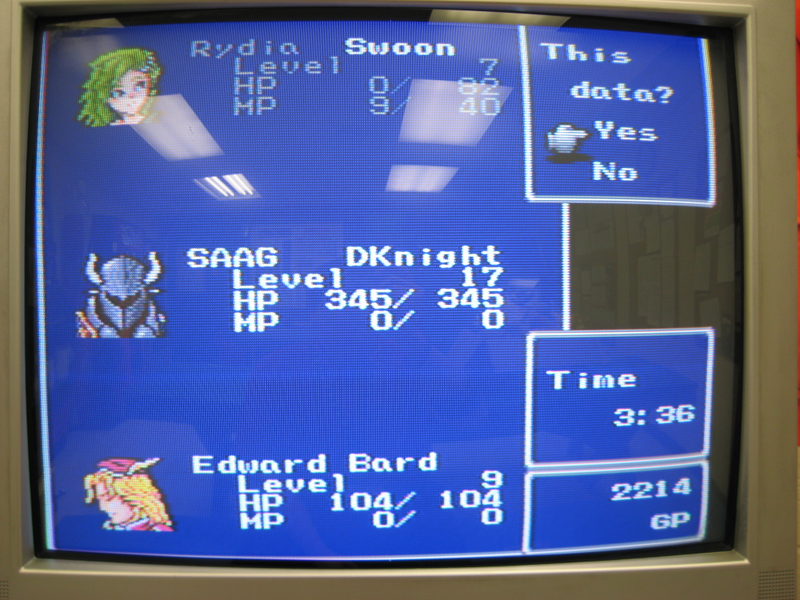 They saved the game with Rydia killed in the caves near Damcyan. For whatever reason, they named Cecil "SAAG." This is an anomaly, because this name doesn't appear in any of the other save files. 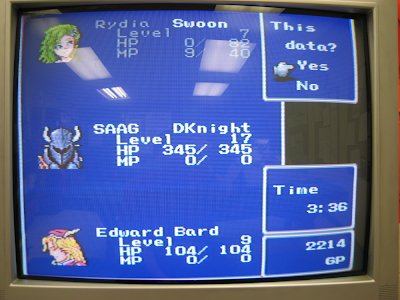 Additionally, Rydia is not named Anna like she is in the other saves, so maybe this save game wasn't one made by the original owner(s). They saved their game in one of the caves between Kaipo and Damcyan. I theorize that they didn't know where to go and ended up back in these caves in an attempt to find their way. 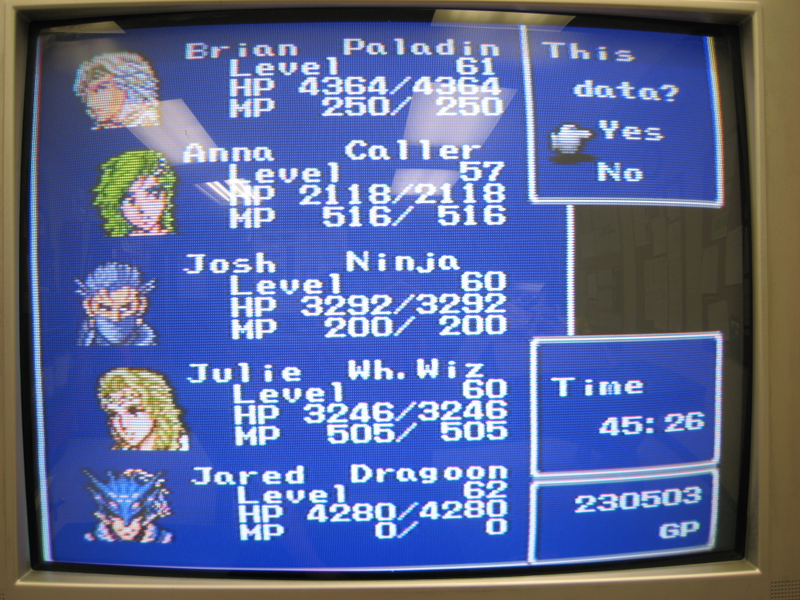 The fact Rydia and Edward's levels are so low tells me that they weren't here to level grind. Or, maybe they were and that's how Rydia died. They did have several Life potions in their inventory, so I don't know why wouldn't bring her back unless it was a deliberate move to level Cecil (SAAG) and Edward faster. 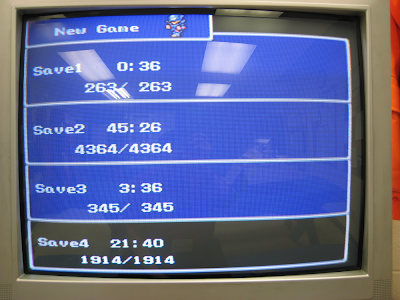 The fourth and final save slot was the second most played one at 21 hours and 40 minutes. What I find odd about this is that Cecil is named different than the Cecil in the second save slot. All the other core characters are named the same between the two. Now I'm questioning whether or not my original theory is correct. The only thing that makes sense is that maybe Brian and Jason are brothers. But... that would mean that since Cecil is involved with Rosa, and they both named Cecil after themselves, both brothers like the same girl! Potential drama coming at us from over 20 years ago! It's also entirely possible that this game belonged to a girl, since those names are consistent between the two saves. 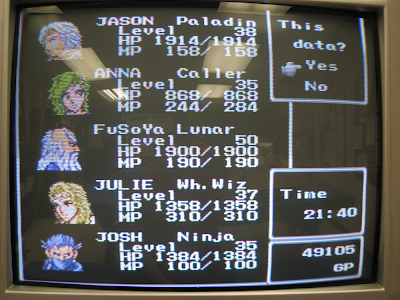 This could be Julie or Anna's copy of Final Fantasy 2. This save is directly before the four fiends. This could have been a, "Hey, this part is really fun! I'm going to always have a save game here!" or "Oh my God! This part is so hard! I give up!" The latter is what I experienced on my first playthrough, so this actually made me smile that they were perhaps stuck at the same spot I was all those years ago. Now that I think about it, maybe they've been stuck here since the game came out! Maybe back in 1991 Jason sunk 21 hours and 40 minutes into the game only to get stuck at a tough boss fight. Between all the save slots, at least 70 hours and 42 minutes were spent playing this game. It could be more if they ever saved over other save files. 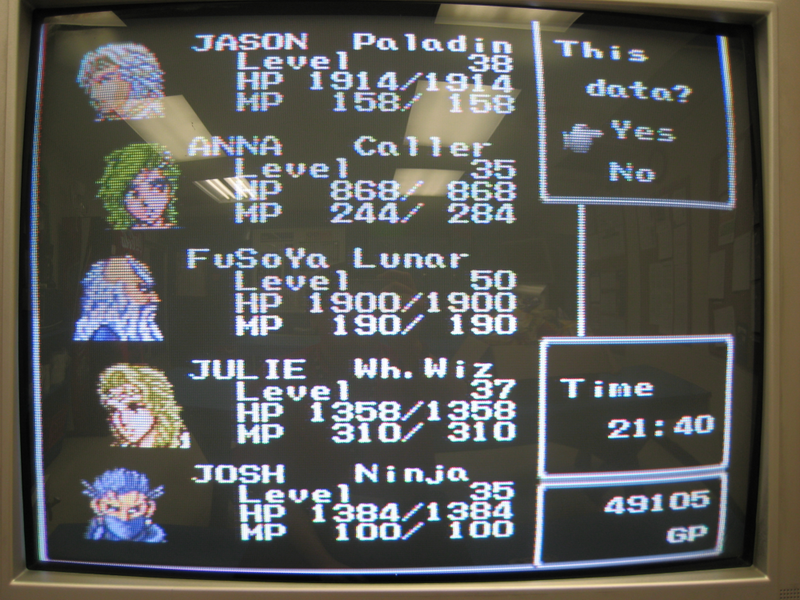 I would say that the first save file was created over another one since the play time was so short, so there's no good way to accurately figure out how much time has been devoted to this specific cart. I find it highly intriguing. Maybe it isn't, but I really think it is. It's a snapshot, a moment in time, giving us a glimpse into the lives of the previous owner(s). And it's all thanks to a 21 year old CR2032 battery that never gave up. © 2013 KREATIVEassassin. Awesome Inc. theme. Powered by Blogger.